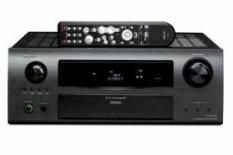 Denon AVR-3310 review | What Hi-Fi? The seven-channel 120W AVR-3310 has been UK tuned and tweaked for maximum performance. It has completely revised power amplifier construction, and built-in jitter reduction technology, that Denon claims helps reduce distortion and any timing errors in the digital inputs. Invest in a '3310 and you get Denon's traditional robustness, in a pleasing-to-look-at, understated package. At this price, virtually all your input and output needs are catered for. There are five HDMI inputs, multichannel analogue inputs, and outputs for second and third zones. Plus there's HDMI-to-HDMI upscaling and picture processing and you can make picture adjustments to both analogue and digital video sources, including contrast settings, chroma levels and noise reduction. The '3310 also packs in networking functionality, so you can connect to a network and stream internet radio stations, display photos stored on a home PC and even stream music from Napster's online, subscription-based digital music service. The playful, frisky character of Denon's AVR-1910 is evident in the '3310 too. This amp can be forthcoming yet restrained when the soundtrack requires. Surround effects are steered confidently between channels – when Maximus struts his stuff in Gladiator, you feel as though you're fighting next to him, surrounded by the baying masses. The Denon wades in with a huge helping of bass weight, although it isn't most agile or defined we've come across at this price. There's also a slight thickness that robs voices of clarity. These characteristics carry through with music, too. We were expecting this amp to continue Denon's rich vein of form. To a large extent it does – but without really setting the bar high enough to trouble the current class leaders.